Coach was removed from his job with the Wolverines last year after an investigation found numerous rules violations. 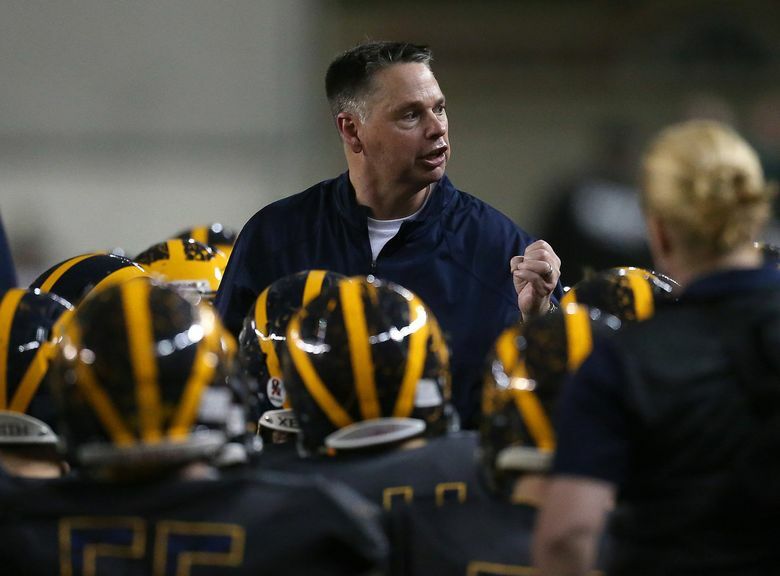 Cedar Park Christian principal and athletic director Todd Lundberg announced Monday that the school has hired former Bellevue football coach Butch Goncharoff. “After a year out of high school coaching he is excited to become a part of a Christian School and looks forward to not only coaching football but, more important, helping build young men of character and integrity,” Lundberg said in a statement. Goncharoff guided Bellevue to 11 Class 3A state titles in 16 years as coach of the Wolverines with a 193-14 record. Goncharoff was removed from his job in 2016 following an investigation by the Washington Interscholastic Activities Association that found wide-ranging violations of state rules. That investigation followed a series of stories in The Seattle Times that detailed possible violations. Cedar Park Christian is a Class 1A school in Bothell that plays in the Cascade Conference. The Eagles were 4-6 last year under third-year coach Bill Marsh, who previously coached at Eastside Catholic. Goncharoff didn’t return phones messages seeking comment. “I sense that he’s excited as any coach could be for a new opportunity,” Lundberg said. Also: Bellevue Football announced via its Twitter account that interim football coach Mark Landes was named head coach. The Wolverines were 5-1 last season under Landes.